I’m the director for Outskirts, however, as always with a small team there’s a few hats we all wear and I’ve also been very involved in the set design for this piece. We’ve been a very design driven company since the beginning and my practice as a director with The Bare Project has always involved working closely with designers. The original members of The Bare Project met at the University of Sheffield. We all had a desire to put on a show outside of a traditional theatre space and began a very supportive relationship with a local, higgledy-piggledy art gallery called Bank Street Arts. The play was about an orange circus bear and a snow storm, but the title of the piece was continuously changing- so we became known as The Bare Project. When we were later asked to make more work with Bank Street Arts, we kept the name (but changed the spelling of bear, just to keep people on their toes). We began The Bare Project to try new things and to push at the edges of our craft as theatre makers. It was a playground and a training ground for us as well as for the artists we work with. I think this persists. The team has grown and changed, our work has got more ambitious, and we all have a good deal more experience and skill than that first piece, but I think that approach has stayed. We still want to play and push ourselves, and to provide a space for all our collaborators to try out new ideas and techniques too. The two big ideas in this piece for me are storytelling and memory. There are two characters: one, Lucian, can’t remember anything of his life, and the other, Yani, tells him his story, through which it becomes apparent why Lucian has lost his memory. I believe there are two kinds of storytelling taking place through the play. In our rehearsals I’ve named them: that of the ‘Fool’ and that of the ‘Trickster’. The former recounts truths, which must be remembered and passed down. The Fool is poetic and aesthetic- images help the words and their meaning stick. The Fool allows for complexity and contradictions. The Trickster offers us deliciously simple stories, which depend on internal logics and half-truths. We repeat them because they allow us to make sense of a world that is often hard to understand and in their repetition they grow larger and larger and more and more undeniable. Stories are very important to the world we live in- it is how we pass on knowledge, and from them our values and opinions are formed. They shape the world we live in. This play, for me, offers a dreamlike parable on the dangers of the Trickster’s stories and the importance of remembering what went before. What made you want to take this show on tour? There are some fantastic venues across the North who are working with lots of companies that we are inspired by and we really wanted to be a part of that. 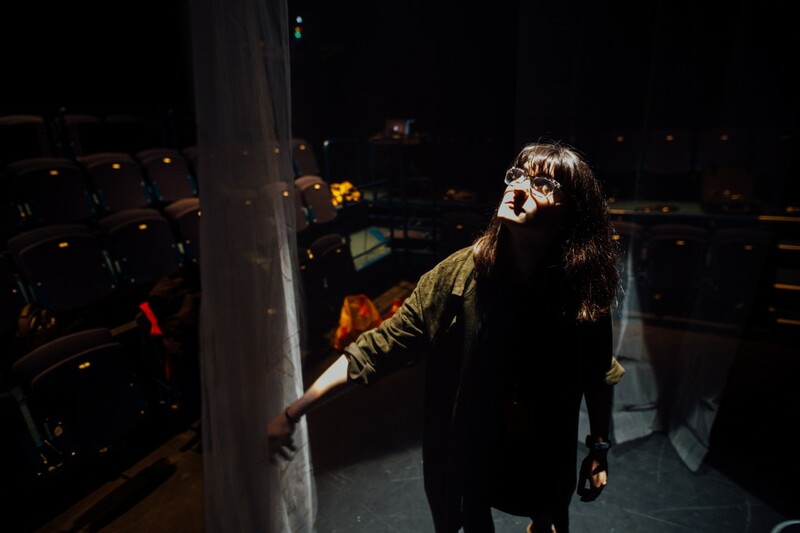 Our past work in site specific theatre could feel a little isolated at times- and also meant we could only get our work out to very limited numbers of people in one place. This show felt like the perfect opportunity to build relationships with the venues we love and audiences in new cities (beyond Sheffield). It is also an opportunity to push ourselves in a new direction as a company. For once, we don’t have to worry about things like whether a venue has electricity or heating… I think knowing those things will be a given gives me the space to think more deeply about design and performance in this piece. What’s next for The Bare Project? After the Northern tour of #Outskirts we are hoping to tour the piece nationally and maybe even internationally next Spring. We’re also just about to start work on a new project inspired by an Oliver Sacks book called Island of the Colorblind, which is also about islands … we’re not obsessed by islands, promise! There may well be a few more immersive installations on our horizons too- so keep an eye out for those!